The home provides spacious 3-bedroom, 2-bathroom accommodation with games room, free WiFi and its own private screened pool. This comfortable and well furnished home is located on Indian Point, a peaceful subdivision situated 10 minutes from the Walt Disney World entrance. It is also conveniently located for the other attractions such as Seaworld & Universal. Indian Point also has its own community area with swimming pool, tennis court, childrens' playground and picnic area. The pool area is south facing and has conservation views. The living area has a leather sleeper/sofa and a 30" flat screen TV & DVD player. The kitchen is well equipped and has a microwave, refrigerator-freezer, range, toaster, coffeemaker, pans etc. The kitchen also has a dining table that seats 4. There is also an additional dining area with a table that seats 8. The home has an ample supply of towels & linens and is also equipped with a washer and dryer (located in the garage). There is cable TV in the living room and in the master bedroom and the home is equipped with free Wi-Fi and free phone calls in US and Canada. 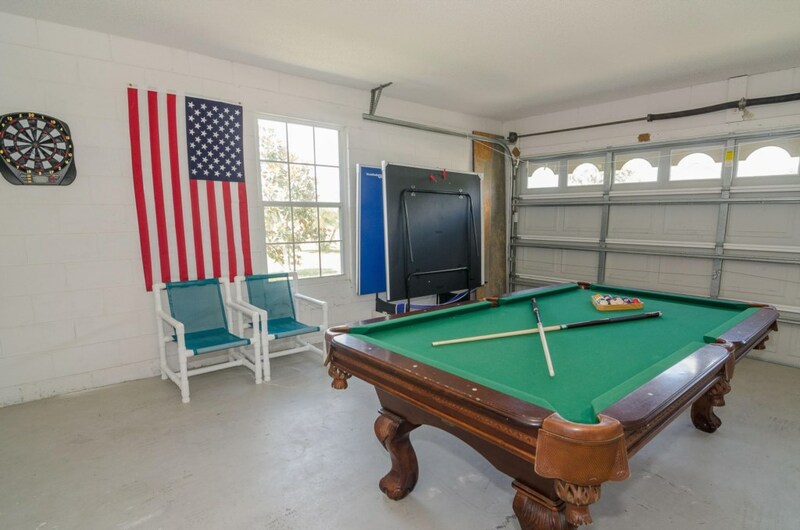 The games room is in the garage and has a pool table, darts, and table tennis. This is a non-smoking home. Pets may be considered. This is a great house with a close location to all parks. The pool is very nice and was a great addition to our vacation. It is such a nice place to relax at the end of a long day in the park. Many restaurants and shops close buy make it easy to have a economical trip to Disney as well. The house is really roomy. Plenty of space for several families to stay comfortably. The house is in a quiet, working class neighborhood located about 10 minutes from the entrance to Disney parks. We will definitely return in the future. Place was great - comfortable and perfect for any family’s getaway, quiet neighborhood, great size pool and grill by the pool! Easy access to main routes, 25 minutes drive to Disney and 35-40 to Orlando. Nice, quiet location. There was plenty of room to accommodate our big family. Nicely decorated and very clean. The pool was warm during the day but cooler at night. It wasn't far from the theme parks at all. Great place, great location and great value. We would definitely stay here again and highly recommend! Perfect spot for family and friends to go and do anything in Orlando. House is clean and bright, fully stocked and ready to go. Great quiet location. Rent this place and you'll be very happy. Great value house. Spacious and clean. Good size kitchen to make food in and nice pool with a BBQ. Would reccomend this to everyone looking for a good deal close to Disney World and Universal.